In case you’ve been living under a rock, there’s a form of velodrome racing in Japan known as keirin , and the bikes used in the professional ranks are made to very exact, high quality standards yet are almost anachronistically traditional in design. But what you might not have known is that professional keirin exists in Korea as well. When I was in Korea a few years ago, I didn’t have enough time to find a track. 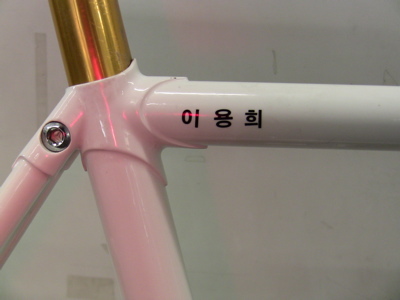 I hadn’t thought much about Korean keirin until a customer came into the shop a few weeks ago with a keirin bike with distinctly Korean characters on it. 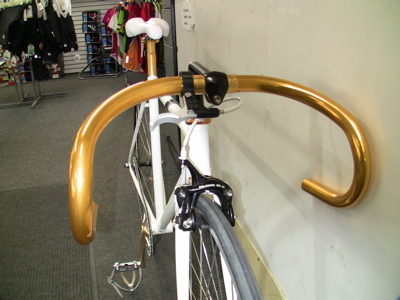 I hadn’t quite occurred to me that Korea would have it’s own keirin builders, but it makes sense. Korea is a very proud country, so I’d imagine that the riders or professional association would prefer domestically made framesets. 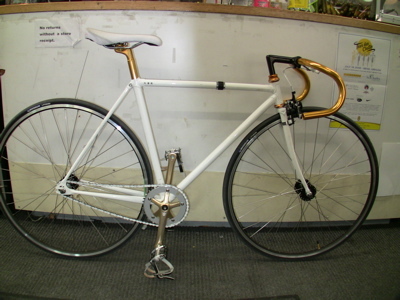 The customer brought the bike in to have a gold Chris King GripNut headset installed yesterday. She had the bike custom made for her while she worked in Seoul for a year. That is a super sweet memento. 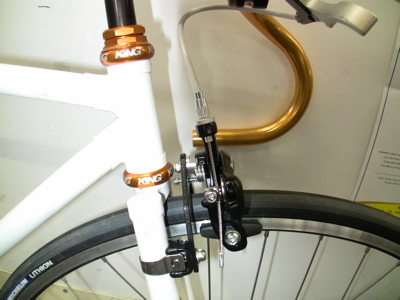 She also is trying out a front brake adapter, since the front fork is not nor can it be drilled for a front brake. So far she isn’t too impressed with the performance, but I’d like to toy with it to see if I can improve that. 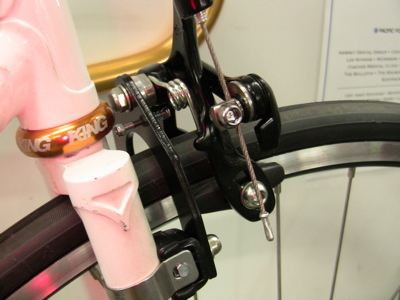 If only I could get these brakes that Koh Annoura, famous former professional Keirin rider, showed me last year. By the way, it’s her name written on the top tube, and the letters are under the clearcoat. I assume that it’s her Korean name rather than her Anglo-American name. My girlfriend has a Mandarin name and an American name. I want 2 names. Even my old roommate, son of Greek immigrants, has two names. It’s like being a secret agent.